While Senate is pushing on amending the Bill to extend passport validity, House Congress moved to approved and consolidate and iron-out the details to extend to 10 years from the current 5 years. Former President Gloria Macapagal Arroyo, and currently representative of Pampanga is one of the authors of the bill extending the validity of passport to ten (10) years from the current five (5) years. Report said that the House Committee on Foreign Affairs has approved the bill and will create a technical working group to discuss and iron out the bill for final approval of the committee and in turn, pass into law. House committee chairperson Rep. Linabell Ruth Villarica made the announcement after a motion to approve was made by one of the authors, House Deputy Speaker Gloria Macapagal-Arroyo. Department of Foreign Affairs supports the idea of extending the passport validity in response to the clamor of many Filipinos, especially overseas workers. Senator Alan Peter Cayetano is pushing for the establishment of a seamless and hassle-free processing of passports for Filipinos here and abroad. The senator on Tuesday (October 4) expressed his support to lengthen the validity of Philippine passports from five to ten (10) years. Cayetano chairs the Senate Foreign Relations Committee, which conducted its first public hearing on the proposed measures to extend the validity of passports. This proposal is in line with President Rodrigo Duterte's earlier directive to amend Republic Act No. 8239, otherwise known as the Philippine Passport Act of 1996, which sets the validity of passports to five years. The President, in his first State of the Nation Address (SONA), lamented how Filipino passport applicants have to endure long lines or even stay overnight as the government can only cater to a limited number of applicants per day. The senator stressed the need to simplify the application system in order to ease the people's burden of having to renew their passports every five years, and to prevent backlogs and delays in the issuance of passports. "We're here to have the first low-lying fruit output from the legislative and the executive, which is the issuance of passports - how to make it easier," Cayetano said. The senator also stressed the need to make the passport application process easier for Overseas Filipino Workers (OFWs) and other marginalized groups, including Persons with Disabilities (PWDs) and senior citizens. "OFWs, PWDs, and senior citizens should be given priority, not because they want special treatment, but because they have special needs," Cayetano explained. Cayetano said OFWs in particular should be given priority because any delay in the processing of their travel documents could cost them their jobs abroad. He said he plans to visit the one-stop center for OFWs located in Clark, Pampanga in November to see how the systems and services can still be improved to address migrant workers' concerns. Meanwhile, Foreign Affairs Secretary Perfecto Yasay also backed the proposal to extend the validity of Philippine passports. 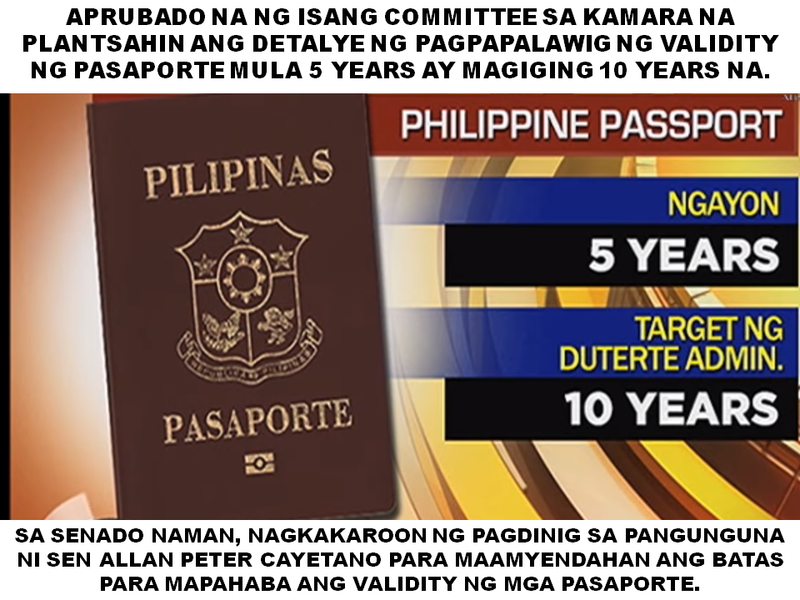 "Let me just say that the Department of Foreign Affairs has no objection to the proposal to increase the validity of passport from five years to 10 years," he said during Tuesday's hearing.